Hello...and happy Tuesday to you! The month of August is almost at an end and with it my time as guest designer for Paper and Such! I have thoroughly enjoyed working with this month's released stamp set, Wings and Such, and with Julie and the other fabulous members of the design team. Since the new challenge at the Paper and Such Blog is "Wings and Things," I had another chance to use this beautiful set. 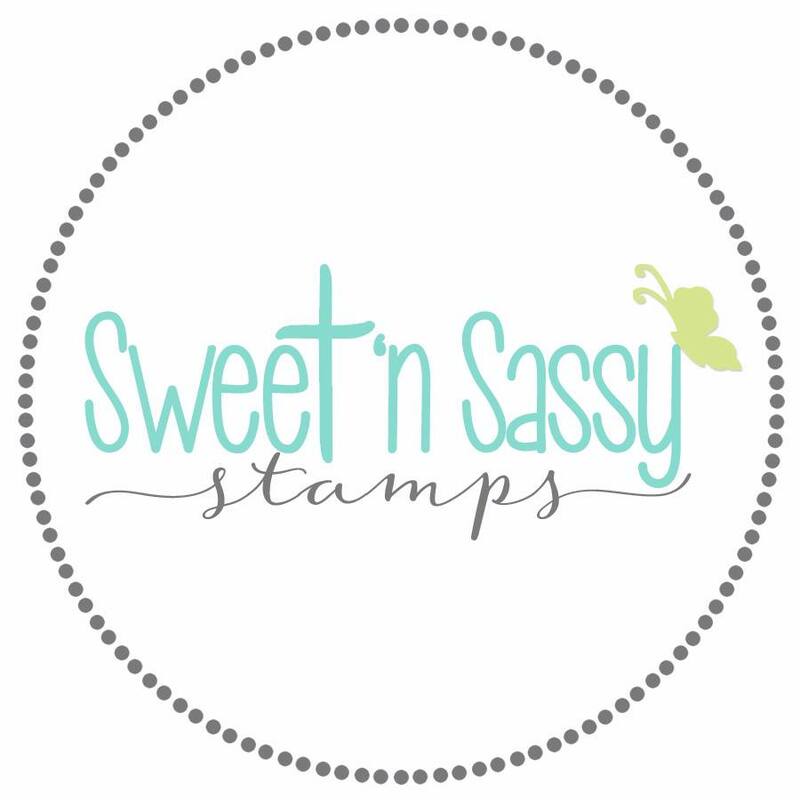 Creative Nugget: The featured stamper this week on Splitcoaststampers is Mary (a.k.a. jandjccc) , and browsing her gallery gave me the inspiration I needed for this card. Many of the cards in her gorgeous gallery used the technique of layering embossed panels. So I began with a Cheery Lynn Lattice die cut and layered it on a piece of linen colored DP by My Mind's Eye. This was run through the Big Shot with a Canvas Impression Plate and stitching was added around the outside border. A frame was cut out of this panel with a Romantic Rectangle Die and a bow tied under the cut out frame. This was attached to a Neenah Solar White card base. 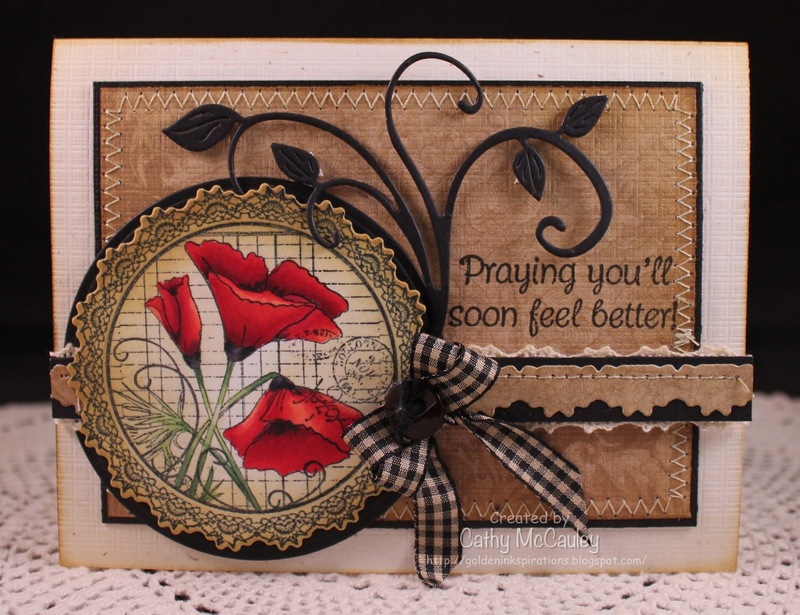 The flourish from the set was stamped using Antique Linen Distress ink and the sentiment was added over the flourish using Versafine Onyx Black Ink. 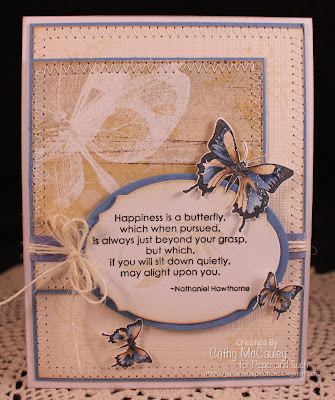 A Sizzix embossing folder added texture to another piece of Neenah Solar White card stock. I cut out the embossed part of the panel and attached it to the card. 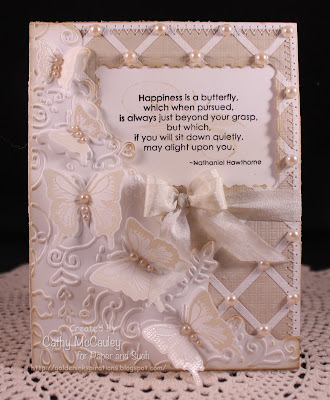 The butterflies from the set were stamped on vellum using a VersaMark pad and embossed with white detail embossing powder. These were cut out and attached to the embossed butterflies. My favorite...Kaiser Pearls were added to finish the card. I really like how elegant this card turned out, and hope that you like it, too! 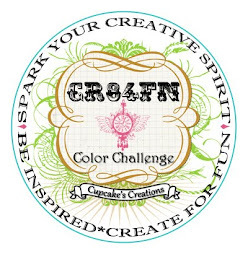 Be sure to head on over to the Paper and Such Blog to see other "Wings and Things" creations by the rest of the design team and learn how you can participate in this challenge! There just might be a prize up for grabs! Thanks so much for stopping by! Hope you have a wonderful day and may happiness follow you as you go along your way! Happy Saturday to you! Hope you've had a wonderful week and are able to enjoy the last remaining days of summer! Soon the hustle and bustle of a new school year will begin, or has begun for some of you. This will be my second year of retirement from teaching, and it still seems funny not having to get a classroom ready! On Monday, the first day of school for children in our district, all the retired teachers will have breakfast together and wave to the school buses as they go by! :) In honor of school beginning, I made this card for a challenge on Splitcoaststampers..."No Stamping! 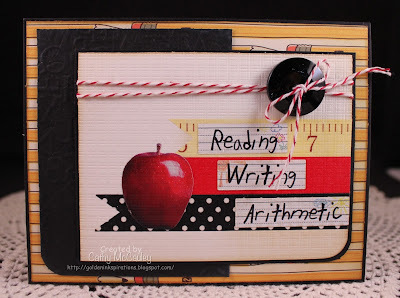 "...only cardboard stickers, Washi Tape, and papers! Now...on to the new sketch at The Sweet Stop! A friend at church lost her mother after a long illness this week. I needed a sympathy card for her, so naturally the Sweet Stop Sketch provided the perfect inspiration. I did need to change the orientation of the sketch to accommodate the image. Creative Nugget: Bridge of Hope, a clear stamp set released two months ago by Sweet 'n Sassy Stamps, was the perfect set to use for my sympathy card. The serene bridge scene was colored with copic markers, cut with an oval Nestie, and mounted to a scalloped oval Nestie. The other panels of the sketch were made with a combination of patterned papers by My Mind's Eye and FabScraps mounted on True Black or Vintage Cream. I can't seem to put my Sew Mini away lately, so stitching was added to three of the layers. The sentiment was stamped on a Tim Holtz Tattered Banner Die, run through the Big Shot with the Canvas Impression Plate, sponged, and attached to the card. 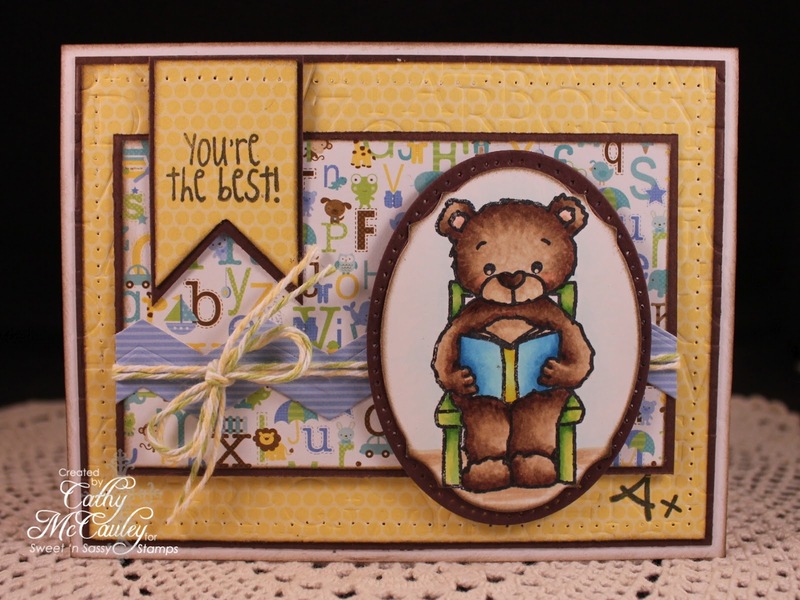 Some gingham ribbon was also sponged with distress ink and added to finish the card. I hope and pray this card will bring some comfort to my friend. I have a Christmas version for you this week! 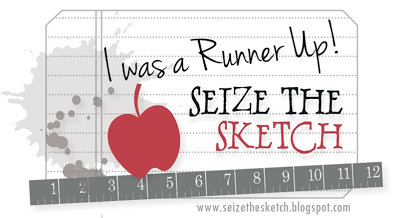 If you love woking with layers, you will love the sketch this week. Don't forget to check out the other Sugar Babies for more fabulous inspiration. Thanks so much for stopping by...Hope you'll be able to join us this week. 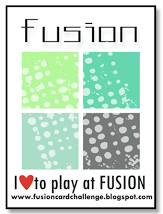 As always, we look forward to seeing your fabulous creations! 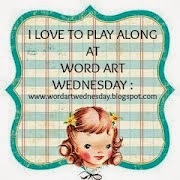 Happy Saturday to you, my blog friends! I hope you all had a marvelous week! Are you ready for another fabulous sketch from The Sweet Stop? Not only are you going to enjoy working with this sketch, but it is the third Saturday of the month which means it's a sketch with a spin, and that means...PRIZE TIME! 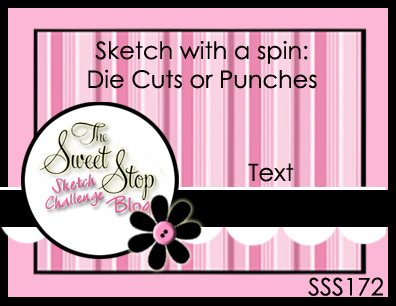 Get ready to create with punches and dies because that's what the spin is this month! 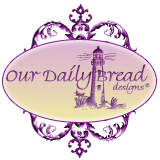 Creative Nugget: I just love how my sample turned out this week...love the vintage look of this elegant stamp by Our Daily Bread Designs from the stamp set "Serve the Lord." The best thing about this stamp set is that matching dies are available to go with it. I began by stamping the poppy image on Neenah Solar White with Tuxedo Black Ink, coloring the image with Copic Markers, and sponging around the poppies with distress inks. The image was cut out with the matching die. The clean and Simple layers were made with Bo Bunny patterned paper, True Black and Rustic Cream card stock. Stitching was added around the border of the second layer and on the crocheted Border Die. 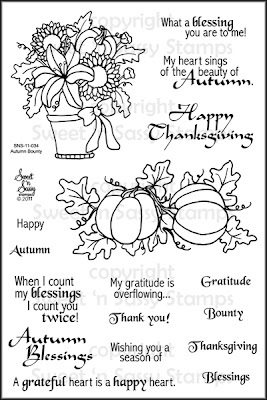 The Fanciful Flourish Die was trimmed to fit around the image, and the sentiment from the Mini Tags 1 set was added. A gingham bow and button finish the card! 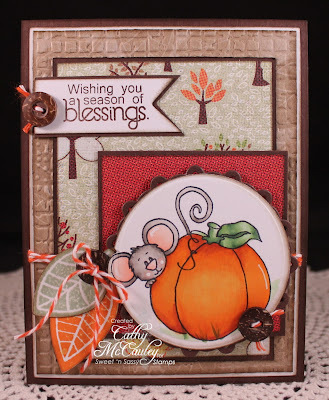 Make sure you check out how the other Sugar Babies used die cuts on their samples for this week....cute, cute, cute! Can't wait to see the creative ways you use your punches and dies! 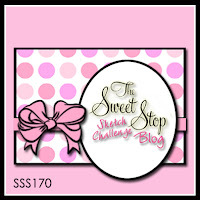 Just upload your creations for SSS172 using the linky tool over at The Sweet Stop! 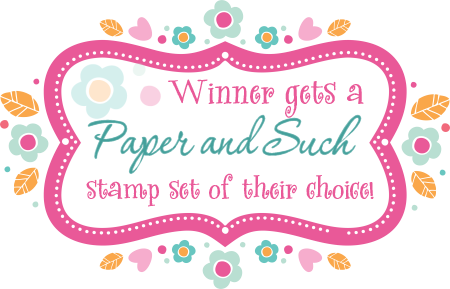 You just might be the winner of this fabulous stamp set from the Sweet 'n Sassy Store! Thanks so much for stopping by...hope you have a wonderful weekend! Hello again, friends! SURPRISE! This is my second post for today! If you are looking for my Paper and Such sample, just scroll down to the next post. It's also time for a new challenge over at the Can You Digi It? Blog, CYDI #16 - Purple Please. I have to be honest with you...purple is NOT a favorite color and I very seldom use it; however, a lavender purple mixed with a bit of green is not so bad! 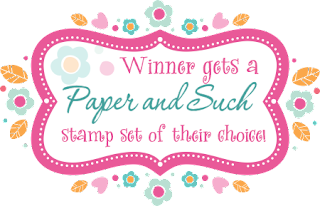 Creative Nugget: The Good Shoes and Shoes and Shopping images on my sample are digital stamps by LilyPink Designs over at the CYDI? Store. The background was made by randomly printing several shoe images onto Neenah Solar White card stock and coloring them with Copic Markers. Texture was added to this panel with the Canvas Impression Plate and stitched to Marvelous Magenta card stock. The DP from the Purple and Green Paper Pack by Striped Elephant, can be found at the CYDI? Store, and was also stitched to the background. The sentiment panel was colored with Copic Markers. A corner rounder was used to frame the image and this was mounted on a Spellbinders Label Die. 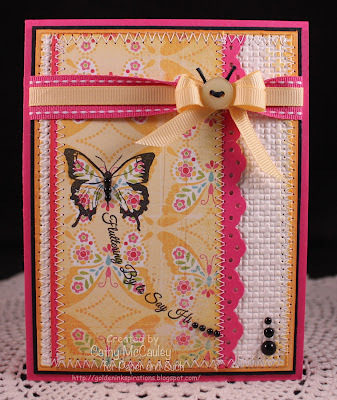 A wired butterfly, some brads and rhinestones, and Baker's twine were added to finish the card and give it some bling. 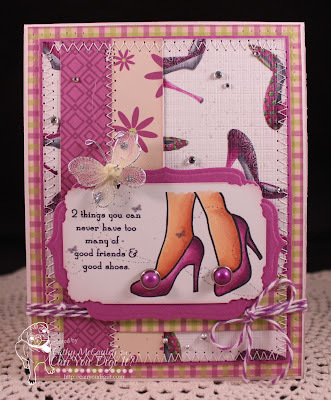 This card will go to my niece who loves shoes and purple! If you like purple, and even if you don't, check out the details, see other fabulous purple samples by the design team, and join the challenge over at the Can You Digi It? Blog. We'd love to see your purple creations! Happy Tuesday stamping friends! 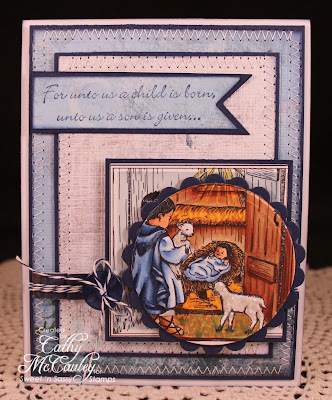 This will be my second post as the Paper and Such Guest Designer for the month of August. 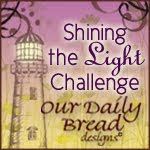 Today is the launch of a new challenge over at the Paper and Such Blog. I hope you will be able to join us as we "Stamp on DP!" I used the new stamp set just released last week, Wings and Such, for my sample. Creative Nugget: I couldn't believe how perfectly the one butterfly image in the set matched the butterflies on this Urban Prairie DP by Basic Grey. 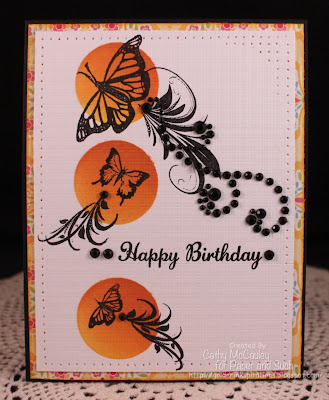 I stamped the image directly on top of one of the butterfly images on the DP in Versafine Onyx Black ink and added the sentiment trail. The panel was stitched to some Raspberry Fizz card stock that had been punched with an eyelet border punch. This was then layered onto Select White card stock with texture made with a Square Lattice Embossing Folder. Layers of Marigold Morning and True Black were added before mounting the whole panel to a Raspberry Fizz card front. Some ribbon and pearls finish the card! Now it's your turn. 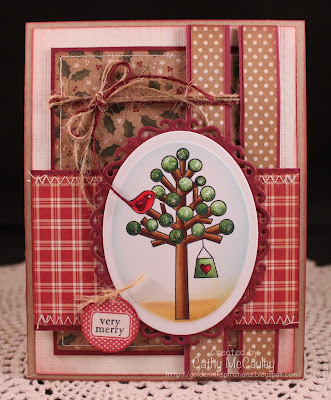 Check out the other amazing cards by the Design Team on the Paper and Such Blog, then grab some DP. 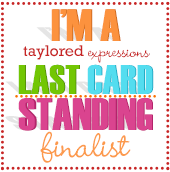 I can't wait to see how you stamp on yours! 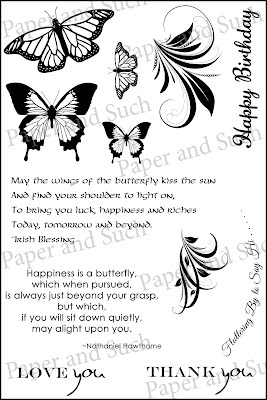 Thanks for fluttering by...have a wonderful and blessed day! Happy Saturday, Sweet Stop friends! Hope you had a great week! 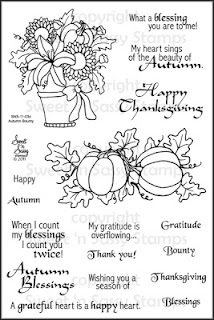 With all the hot weather and drought we've been having across the country, I feel ready for fall...especially since Sweet 'n Sassy Stamps released some wonderful new fall stamps! So with fall stamps in hand and a brand new sketch at The Sweet Stop, I'm ready for some Fall Time Cocoa! Creative Nugget: Looks like Cocoa is ready for fall, too, as he is peeking around that big pumpkin. Cocoa was stamped on Neenah Solar Crest card stock and colored with copic markers. The out-of-the-box technique was used along with a circle nestie to cut out the image. This was mounted onto a Dark Chocolate Fleur de Lis Motif die. The next two panels of Basic Grey DP were also mounted on Dark Chocolate. It's hard to see, but the kraft layer was randomly stamped with several leaves from the new Leaf Silhouettes clear stamp set with VersaMark ink, and embossed using a Tim Holtz embossing Folder. Here's a little embossing tip: I always cut the panel a little larger than I need, emboss the panel, then cut it to the correct size. Embossing always seems to shrink the size of your panel a little, and this way you get the perfect size you need! All panels were layered onto Neenah Solar Crest, and then to a Dark Chocolate card base. The two leaves from the Leaf Silhouettes set were stamped and fussy cut. A hole was punched in the top of the leaves so the Baker's twine could be threaded through and a button attached. The sentiment was stamped on a strip of Neenah Solar Crest and the flag end punched with a photo corner punch. This also was mounted on Dark Chocolate. A few buttons finish the card! If you love layers, you will love working with this sketch! Before heading off to your special crafting space, check in with the other Sugar Babies to see their fabulous samples for this week. 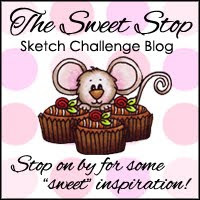 Can't wait to see what you do with the sketch over at The Sweet Stop! Thanks so much for stopping by! 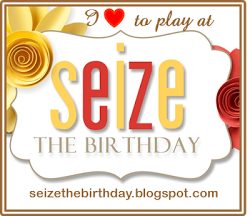 Cathy McCauley - Guest DT <---you are here! If you have come from the Paper and Such Blog you are in the right place...if not, be sure to begin there for all the details of the hop! Wings and Such will be available at Paper and Such for only $12. Creative Nugget: The flourishes were stamped on a Decorative Plaque Die and in each corner of a Vintage Cream panel using Antique Linen Distress Ink. The cream panel was impressed with a Canvas Impression Plate and stitched to Blueberry Sky card stock This was mounted to a Select White card base. The Basic Grey DP was also stitched to Blueberry Sky. The sentiment was stamped over the flourish on the plaque and mounted to a Blueberry Sky Oval Nestie. The butterflies were colored with Copic Markers, fussy cut, and mounted on the ends of the flourishes. Some glitter and a button twine bow finish the card. The second sample has a totally different look! Creative Nugget: For this sample, reverse masking was used to make the three circles which were sponged with Fired Brick, Dried Marigold, and Wild Honey Distress Inks. The butterflies and flourishes were then stamped using Versafine Onyx Black ink. The sentiment was added before giving the whole panel some texture with the Canvas Impression Plate. The border and right corner were pierced and the panel mounted to some Basic Grey DP and a True Black card front. A little rhinestone bling was added to finish the card. Thanks for fluttering by and have a blessed day! Happy Saturday! Hope you had a wonderful week. It's been another busy one with a new stamp release by Sweet 'n Sassy Stamps and Vacation Bible School at our church. 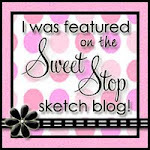 But now it's time to relax with another fabulous sketch from The Sweet Stop! Can you believe it's August already? In no time at all, the kids will be heading back to school. It still seems funny not to be thinking about going back myself, but since retiring, it's nice not to have to worry about prepping a classroom! 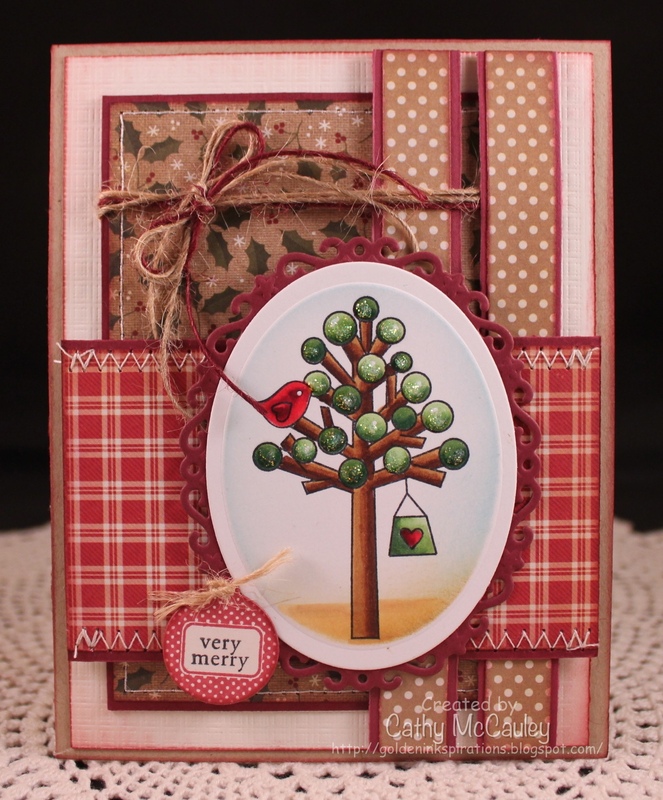 One of the new stamp sets released by Sweet 'n Sassy Stamps this month is "Back to School Rhubarb," perfect for this time of year! Creative Nugget: Reading Rhubarb was stamped onto one of the Decorative Plaque Dies by Sweet 'n Sassy Stamps and colored with copic markers. His fur was given texture with colorless blender ink and an old washcloth...a technique I've been enjoying lately! 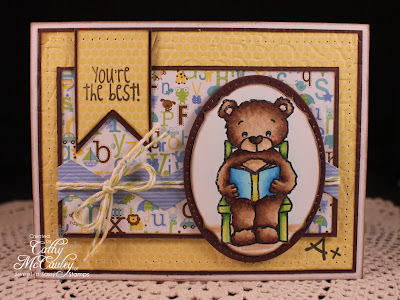 Each panel of the Doodlebug Design patterned paper was layered onto Chocolate Chip card stock. Letters were impressed into the yellow layer using the Book Print Impression Plate and some piercing was added around the border. A strip of ric-rac and Baker's twine were added across the top panel, and Rhubarb was popped up on top of that. I wasn't sure where to add the sentiment, so I deviated from the sketch a little by adding a banner to finish the card. Be sure to check out what the other Sugar Babies have done with this sketch, then play along by entering your card over at The Sweet Stop!